If those fancy wheel covers don't look "correct" to you, it's because Howard's dad kept the hubcaps from the 1968 LTD he traded in when purchasing the 1971 car, then used them in place of the new car's standard dog dish hubcaps. 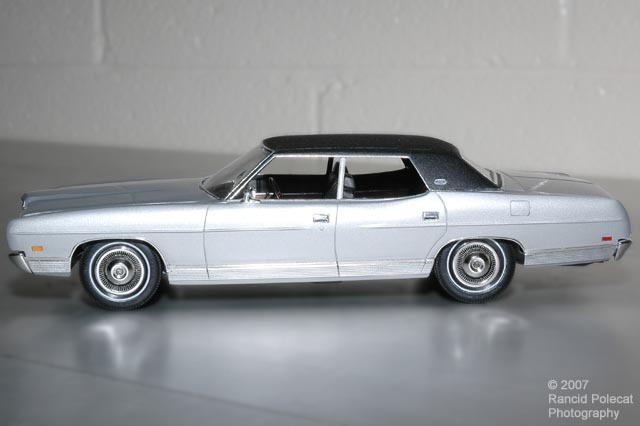 Tamiya Mica Silver from a rattle can nicely approximates Ford Light Pewter Metallic and Testor lacquer system upholstery black replicates the textured vinyl roof. Howard created the unique roof pillar and grille badges on his computer by editing images from car-show photographs, eBay auctions and dealer brochures.